Lost in Life After College? Coaches: Help recent grads go from confused to focused—and in a job they love. Millennials: Cut through your mental clutter to find the path to a fulfilling career. Are you coaching a recent college graduate who can't find a job? Are you an unemployed or underemployed Millennial? Here’s the complete guide for helping grads find direction after college! Like Alice falling down the rabbit hole, college graduates entering the workforce can feel lost and bewildered. After the structured atmosphere of college, many are overwhelmed by the job search, anxious about their direction, saddled with crushing student debt, and unable to move forward. This book provides a way out of the confusion. 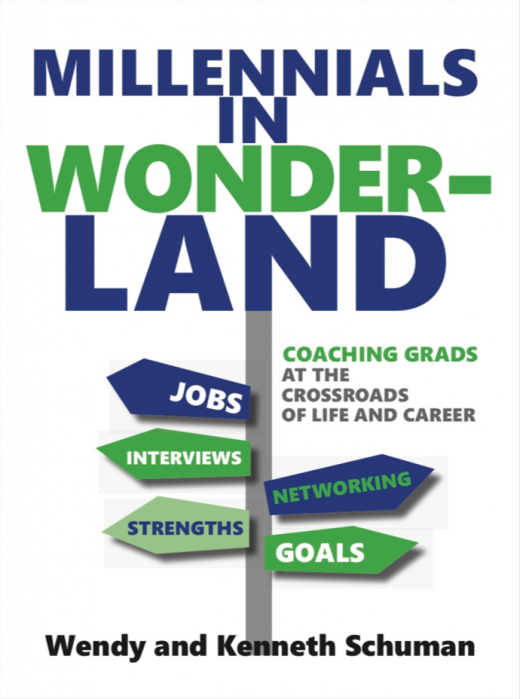 “This book is a treasure of heartfelt stories of Millennial frustrations and success in finding meaningful work and how coaching got them from no job to a job they were excited about. The coach contributors draw upon their lessons with Millennials to provide provocative questions, methods, and advice to up your game in coaching this generation." Several years ago, Ken and Wendy Schuman started Grad Life Choices–a free coaching service to help unemployed and underemployed young people identify their personal strengths and successfully transition into the workplace. This pro bono program has helped nearly 300 grads find or redirect their path after college. 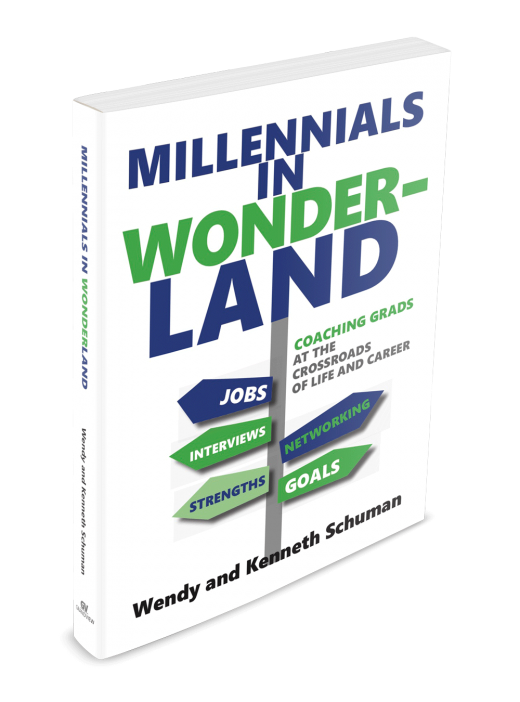 Now Millennials in Wonderland shares the process that has enabled young people from all over the country to unlock their potential, overcome obstacles, and achieve their dreams. Twenty-three leading coaches and experts joined Wendy and Ken in writing this book. It is the most complete resource available for coaches helping Millennials face the future with a plan and a sense of hope. For more about the book’s authors, click on Author Bios. For information on the Grad Life Choices program, click here.